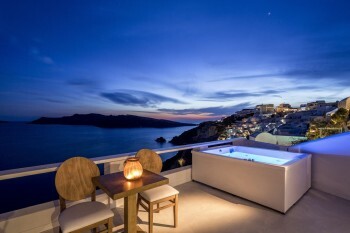 This absolutely stunning and very romantic rental villa is situated on the west side of the island in Imerovigli village. 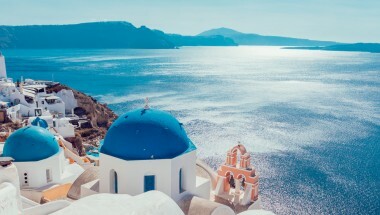 Its position on the highest point of the Caldera ensures breathtaking panoramic views across the Aegean Sea, as well as the magnificent Santorini sunset experience. It is perfect for those looking for luxury, comfort, tranquillity and privacy, and is recommended for honeymooners and romantic escapes, as well as families and groups of friends. It is also an amazing venue for small wedding. Newly renovated throughout, the accommodation (132m2) is on two connecting levels with comfortable living areas for up to 10 people, and five bedrooms with en-suite bathrooms. The extensive outdoor space (180m2) has a heated pool partly shaded with pergola, a sun terrace equipped with sunbeds, an outdoor Jacuzzi, a pergola shaded sitting and dining areas and a small garden. 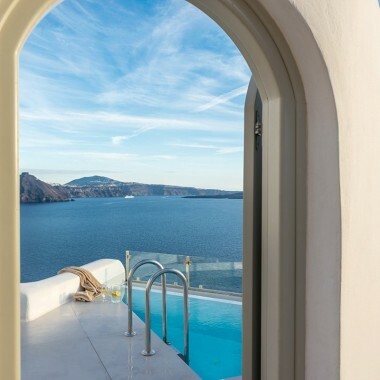 From here, the incredible sunset, caldera and sea views can be enjoyed to the full. The villa’s levels are connected with exterior steps, and each level can be rented separately or the entire property together (although the entire villa has to be rented as a whole during high season). The main villa level has 65m2 of living space as well as the outdoor space. It features a spacious Living room with dining area for 6 guests, an open plan kitchenette and two Master Bedrooms with en-suite bathrooms with shower. The suites (lower) level features a small living area with dining table, well equipped kitchen, three Master Suites each with en-suite bathroom with shower. The many amenities include air conditioning, flat screen satellite TV in each room, stereo system, Wi-Fi internet connection, telephone, hairdryer, ironing facilities and a safe box in each room. Kitchen facilities include a Nespresso coffee machine and ice maker. Living room with dining area for 6 guests, an open plan kitchenette and two Master Bedrooms with en-suite bathrooms with shower. Small Living room with a dining table for 4 guests, a well equipped kitchen, three Master suites each with en-suite bathroom with shower. 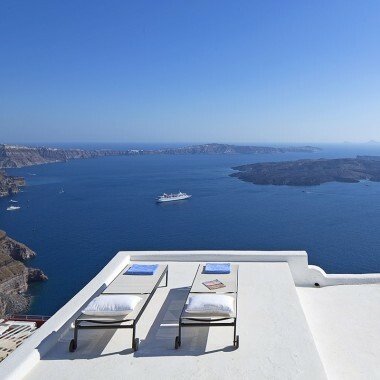 This absolutely stunning and very romantic rental villa is in Imerovigli village, at the highest point of the Caldera, with breathtaking panoramic views across the Aegean Sea, as well as the magnificent Santorini sunse. It is perfect for honeymooners and small weddings, as well as families and groups of friends. Please note there is a rate for renting the whole villa, plus rates for renting the two levels separately - please check with us for details. The villa must be rented as a whole during high season.